If you used PHP on Apache, whether on Centos, Gentoo, Ubuntu, etc., you probably noticed PHP gets slower as most modern PHP framework gets bigger in sizes, more layers, increasing database records, etc. Then, try to install FREE php accelerator called APC (Alternative PHP Cache). APC is a free, open, and robust framework for caching and optimizing PHP intermediate code. In other words, APC will compile PHP code automatically, and can give a boost to your site without modification, 2, 5, 10 and perhaps even more performance boost. One time I had mediawiki, and it was getting really slow, and after installing APC, it’s about 5 times faster. Everytime I install a new PHP application, such as Joomla, drupal, php-nuke, zen-cart, oscommerce, etc., you have to install a new database. If you have a SSH access to it, the following script will do a quick database creation job, with user name & password. type ‘mysql’, and type the following SQL script. You need ‘CREATE’, because, usually installers will try to create a database. You could also add ‘DROP’ so that the installer can delete any temporary tables that it has created. and then finally, you need to flush privilege so that new permission can be in effect. 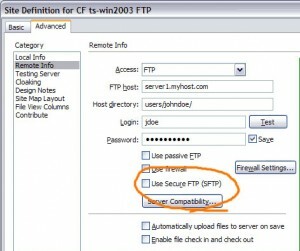 You probably do not want to open FTP as it’s insecure, and open up SFTP, for example, you want your dreamweaver users’ SFTP option. But, the problem here is that, SFTP uses SSH, which will give entire Linux / directory. You want to disable SSH shell access, but, enable SFTP to their home directory only. First, you need latest version of OpenSSH (5.2 at this moment) for ChrootDirectory option to work. If you try # yum install openssh, and it may give option of 4.2 only, then, you have to install OpenSSH 5.2 manually. See this post on how to install OpenSSH 5.2 yourself. Voila! Try to connect your server via SFTP, and it works indeed. drwxr-xr-x 2 root root 4096 Jun 30 12:39 .
drwxr-xr-x 9 root root 4096 Jun 30 12:35 ..
Then, RPM version of SSH installs. After restarting, it may say initlog is obsolete, but, you can ignore as that option is deprecated.